Asbestos was once commonly used in construction, primarily as an insulator to retain heat and keep the cold out. It also has great fire resistance and protects against corrosion. This means that there are plenty of buildings out there with asbestos still in the walls and ceilings, so there’s the possibility of serious illness for homeowners and workers. In fact, all properties built between the ‘50s and 2000 are likely to contain asbestos in some form. In line with 2006 Control of Asbestos Regulations, all materials containing asbestos must be removed and disposed of. The best way of ensuring you fall in line with these regulations is by using a contractor with Health & Safety Executive licensing. Managing hazardous material such as asbestos is a huge responsibility and ignoring any problem that arises can lead to severe legal implications. Every homeowner and employer should be aware of their obligation to dealing with asbestos use in the property. The dangers of asbestos are evident in the four very serious diseases explained below. This is why the removal of asbestos products is extremely important. Symptoms develop over years and you won’t be affected immediately. However, once you’ve been diagnosed it’ll often be too late. Make sure to take action now and have asbestos materials removed from your property. This form of cancer affects the lining of the lungs and is exclusively related to prolonged asbestos exposure. Once you have been diagnosed it will be too late and the disease is almost always fatal. Lung cancer caused from asbestos exposure has the same effects as cancer from smoking. Again, if it’s not caught early it’s likely to be fatal for the patient. This condition causes serious scarring of the lungs, normally resulting from prolonged asbestos exposure over several years. Once the condition sets in the patient will have shortness of breath and in severe cases asbestosis is fatal. Heavy asbestos exposure can lead to pleural thickening. This can cause the lining of your lungs to swell and if symptoms worsen the lung will be squeezed, causing shortness of breath and chest discomfort. It’s clearly evident that asbestos can cause serious health problems and needs to be removed from buildings as quickly as possible to minimise exposure. 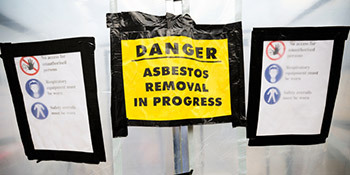 For up to four FREE asbestos removal quotes from vetted Health and Safety licensed companies, simply complete our short form. Project: Moving in to a new home which we have had an asbestos survey done and had asbestos removal quote. I would like another quote to compare methods and costs. i can send the report if required. Project: remove and take away garage aspestos sheet ceiling. Project: Customer visited the myasbestosquotes.co.uk site and submitted an enquiry. Property type: Semi detached, Property owner: , Work description: Asbestos sheet behind electric meter. Under stairs. Project: a double garage asbesto roof need to be removed. Tony and Dave were helpful with good service delivery. I didn't have a home consultation with this firm. Excellent, courteous, polite, businesslike and friendly. Quote received and Job done! sent me contractor details within 10 minutes both e-mail and telephone and contractor responded immediately and the job quoted and carried out to our timescale excellently. Service provided by Quotatis was extremely helpful, efficient and took away all the hassle of finding a company to carry out my work. It was fast and very effective providing information and assistance during my search for a company. Within a matter of days i recieved a phone call from safe environment and they will be dealing with the removal of the materials. Job Done. The below data indicates the energy performance of homes in Uk. Energy ratings vary from A to G, with A being the most energy-efficient and G being the very least efficient. The Energy Performance Certificate (EPC) rating factors heavily if you want to sell your house, as prospective buyers will see what amount they're most likely to be spending on their home heating bills. House improvements such as insulation assist to significantly improve a home's EPC rating. The information below illustrates the several types of homes in Uk. Essentially the most common houses throughout the United Kingdom are detached and semi-detached houses. Other types of properties include terraced houses, flats, converted flats and bungalows. The information listed below gives an indication to the number of properties in Uk which are central heated and non-central heated. Homes are heated by a range of sources which indicate how pricey annual energy bills are going to be. Examples of central heating include gas, electricity, oil, solid fuel and LPG boilers. Changing the way in which your home is heated could see you with cheaper bills. The data underneath shows the spread of houses warmed by different fuels. Throughout the UK the most common hands down are gas heated houses, followed by electricity and then oil. Biomass boilers are also rising in popularity, heated by environment friendly products like wood pellets or agricultural waste.|Homes in the UK are warmed by a variety of fuels, which include gas, electricity, oil, solid fuel and LPG boilers. Each fuel has a varying cost associated with it and that means you could find yourself with less costly energy bills by altering the way your property is heated. Even solar thermal panels are being considered by many people as a way to lower heating bills for the years to come.